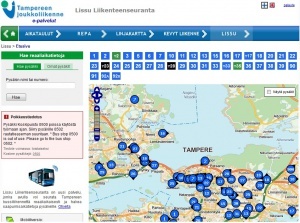 Lissu Traffic Monitor is a service that enables you to monitor Tampere bus traffic in real time and view predicted bus arrival times on stops. Logging enables saving own stops. This page was last modified on 28 September 2013, at 15:34.